If you are an existing fundraiser partner, we would love to hear from you! Good or bad, please email us your testimonials to be posted here or submit them on the Contact Us page. The plants are always gorgeous! Parks Brothers has been fantastic to deal with and we look forward to many more years of collaboration with them. We had a great fundraiser and the poinsettias were beautiful… Honestly, the flowers were the most beautiful poinsettias I have ever seen… Thank you so much!!! Thank you very much for your assistance with this fundraiser. Our team sold out of all the ordered poinsettias before they arrived. We were very pleased with the size and colors of all the poinsettias we ordered. The fundraiser was definitely a success! This year was the best experience since we have been buying from you. Your delivery driver John was very professional and very helpful. The flowers this year looked bigger and better than they ever have. The people that bought them were very pleased. This has been such a good fundraiser for the 4-H program and we look forward to next year. [W]orking with you and Parks Brothers was a great experience! I will definitely call you again for another fund raiser, the poinsettias are beautiful, they are much prettier than the ones you could buy at the store for the same price. You and the driver were the only people from the company that I worked with but you were both very friendly and helpful. I don’t have any complaints at all except that I wish I had learned about your company years ago! We had a great experience with our Poinsettia fundraiser! The communication was speedy and always informative. The plants were beautiful!! We look forward to participating again next year. The poinsettias were delivered on time and looked beautiful! This was our second year to do this fundraiser and we look forward to working with you again next year. The poinsettias were great; looking forward to next year. Outstanding – plants looked amazing. Made for a very successful fundraiser. Thank you. We’re ready to reserve our plants for next year! I was not pleased with my poinsettia fundraiser. I was told they would be here the week of December 5th but did not know that meant last minute on the last day of the week. I did not have time to sell them as expected and definitely lost money in this potential fundraiser thus far. Also, I was told they would only be in pots and that I would need to purchase speed covers before delivering them. I purchased poly foil only to find out that was a waste of money since they come pre wrapped in red plastic covers. I do wish I would have known this information before losing money on this fundraiser. Though they are beautiful poinsettias, I will not be referring this fundraiser to other schools and ag teachers. Thank you! This was by far the easiest and most amazing fundraiser we have done in a while! The plants are beautiful and all plants where bigger than promised!!! The community has had wonderful reviews and we will continue this program in the future! The poinsettias are just beautiful. Our fundraiser went great. We really appreciate you letting us participate. Next year we would like to have [more]. We hope to grow this every year. Thank you. The mums were great; we could have sold more. The size was perfect, color was good; some were not completely opened but opened in 3 or 4 days. Looking forward to next year. Anyway, [the mums] are gorgeous and other than many of our customers being aggravated about not being able to get the colors they ordered and paid for they loved the mums. We will definitely order many more and much smarter next year. I tried to tell our people that it doesn’t hurt to get their order for next year as they deliver and we can order much earlier next year. My only concern is if you had that large of a turnout this year how do I know that everyone won’t order like that next year and still be ahead of us. Anyway, we will try to be way ahead of schedule. Thank you for all of your hard work. Looking forward to working with you for many years to come. Although white will never be my favorite they were some of the largest ones and absolutely gorgeous! The fundraiser went well. Everyone loved the mums and the size for the money. The blooms looked great. It was great just the issue of no yellow mums this year. Just need to do earlier again next year so we don’t run into that. Delivery was great!! You have been awesome to work with and get back to me super fast, which is appreciated!! You did receive the payment correct? I cannot say Thank You enough to Ron with Parks Brothers for all of his help with the mum fundraiser. 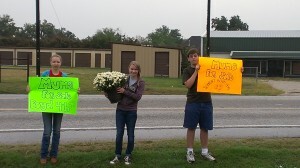 I work for the American Cancer Society and I came across the mum fundraiser last year. I ordered 128 and sold all of them with little effort. This year I extended the fundraiser idea to all of the staff in Western Oklahoma and our Relay For Life teams jumped on board. Together we will profit over $26,000 for cancer research just from selling the mums!!! Every team that has sold them has sold out and could have sold more. Ron was a tremendous asset to us. He is so kind and always returns phone calls, changes orders, or anything we needed to make the process as easy as possible. We plan to sell them again next year so get ready Ron!!!!! Thanks again for the great fundraising opportunity! I just wanted to thank you for your assistance in organizing our first poinsettia sale! It went really well, we sold more than we ever expected, could have sold more and made a nice profit. But probably the best part is… the plants are gorgeous! Everyone who didn’t order one is wishing they did:) Thank you again and I will look forward to working with you again next year! Have a wonderful holiday! The flowers are beautiful and all went well. Thanks so much for another great year. The flowers were beautiful! So many customers want them again next year. Thank you for providing this fundraiser for our club. On behalf of our board of directors and myself, I want to thank you for allowing us to sell your flowers as as fundraiser. We greatly appreciate your working with us during the selling process and tying up loose ends. This has become a good fundraiser for us. Everyone loves the quality and size of the mums. Everyone recognizes your name and reputation which makes them easier to sell. Thanks again for helping us with a great project! We look forward to next year! Girls Shelter of Fort Smith, Inc.
We have our mums. Driver was great… Mums r beautiful. Thanks so much. I wanted to send you a quick thank you for the poinsettias and delivery. All of my parents are extremely happy. The poinsettias are gorgeous. Some of my parents even said that they still have their poinsettia alive from last year. It’s a great fundraiser and it gives the students profit fortheir spring trip. I hope you have a very happy holiday. This is definitely the easiest fundraiser we do have done. This was our third year participating in the Plants for Profit Fundraiser. The Poinsettias are absolutely beautiful! They are brilliantly colorful and full. Each plant arrives in perfect condition. They practically sell themselves. The delivery driver is always on time and Leigh Ann is always eager to answer any questions and prompt to return phone calls and e-mails. From great product to excellent customer service, Parks Bros Farms is a wonderful company to work with. Every year is a great year with our poinsettia fundraiser with parks brothers. Everything from booking to pickup goes smooth. Thanks for a successful program! We took part in 3 of your plant projects this year. I will give feedback on them individually. Spring bedding plants: not our best project! We couldn’t compete with the prices of our local businesses at all. We will not be doing this one again. Mums: Worked great. Appreciate the hardiness and ease of handling as compared with the poinsettias. A few concerns – bronze was NOT the bronze people were looking for. Our reds/bronzes/and burgundy was pretty much the same color. With any of the differences in color, there needs to be a real obvious color difference. 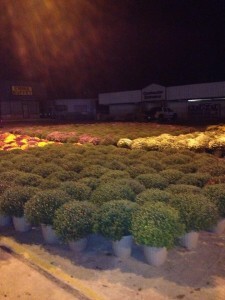 We will be increasing our mum sales next fall. Poinsettias: It is finally beginning to be “easy” to sell them. There were sure differences in sizes this year. We had some that were very small. The red was the worst. Our $10 red was the same size and looked just like the $3.97 red from Walmart. Other colors were bigger and more hardy looking. The Pinks, and Whites were stunning this year. Marble was not the best marble we have had. The ones with a wider pink stripe sell better than the ones we got this year. Jingle Bell was a big hit. We will be adjusting our poinsettia sales down in number to around 550 to 600 plants. We are currently ordering about 200 too many for quick movement from our office. The poinsettias arrived smoothly and beautifully! All of our customers have been overjoyed by how gorgeous the flowers are. This fundraiser was very successful for our organization and raised just under $1000.00. Not only was the Director of Temporary Emergency Services pleased, but also our Board of Directors and parent organization, United Way. My director has requested that I place another order for next year, if possible at this time. We would like increase our purchase to 150 poinsettias, remaining at the 10″ size. Thank you so much for helping us with this project and we look forward working with you in the future! I just wanted to let you know the flowers are beautiful and our customers are very happy with their purchase! …Thank you so much for the help and making this a stress-free fundraiser. The feedback from our buyers have been fabulous…your poinsettias are gorgeous, healthy, and full bodied! Additionally, I was impressed with your packaging as well as well as your delivery. Thank you for being a pleasure to work with and never failing to answer my many questions! Our booster club profited over $5400 in a 3 week period of time. Thank you for a positive and profitable experience! We received the poinsettias this morning. Everyone is just as impressed with them as last year. They are beautiful. Thank you for all your assistance again this year. Have a wonderful holiday season. We had a great fundraiser with Parks Brothers this year. It was the quickest fundraiser I’ve ever seen! The only constructive feedback that I have is to come up with an easier method to ID the different colors of mums once delivered. The mums we received weren’t clearly marked and since they aren’t blooming it took us a while to sort them out. The quality was GREAT! We will definitely be a return customer! Here a couple of pics from early delivery last Friday morning!!! This was another successful year for mum sells. You and the staff at Park Bros. were very helpful…from ordering to delivery!!! Thank you for aiding the students and parents at Pilot Point Middle School!!! The Discover DC fundraiser looks forward to working with you year after year!! The mums are absolutely beautiful and sell themselves!!! Again THANK YOU from Pilot Point, TX!!!! I wanted to let you know everything went great!! Once the driver found the right road, everything went very well. The plants all looked wonderful and are in perfect condition. I would also like to complement the driver, not only was he very friendly and polite. He also helped unload the plants off the racks, which none of the other drives have done before, and this was very helpful. As of right now there are only 2 mums left for us to sell. Thank you very very much for all your help this year!! And we look forward to working with y’all next year!! Thank you to Parks Brothers for always being so helpful and offering such quality products. Our mum fundraiser was such a hit that we sold out in 12 hours and called and made a second order. We can always depend on Parks Brothers to answer any questions we may have and go out of their way to help make our fundraisers successful. 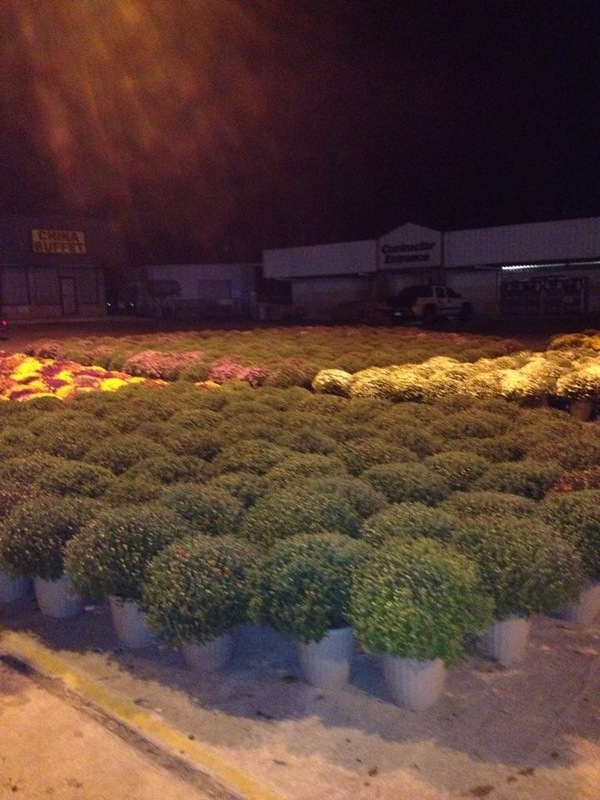 Parks Brothers did an amazing job with our first Mum Fundraiser for our elementary school. Ron, our representative, worked very hard to help us with our first year in selling mums. His explanations and helpful tips made our fundraiser a success! The mums were prettier than we expected and HUGE! The colors and quality are extraordinary, and the mums came in very nice pots. Many people wished they had ordered more mums once they saw how beautiful and exceptional they were. Thank you Parks Brothers for selling quality products and providing remarkable customer service. LOVE, LOVE, LOVE the mums!!!!! They looked awesome & were huge. Most of the ones I’ve seen at Lowe’s & Wal-Mart didn’t look very well this year. This was a great fundraiser & we definitely want to do it again next year. I think we will sell more now that everyone has seen how nice they are. Everything went great! The plants so far look wonderful. Please put us down for the same amount for next year! Love doing this fundraiser! Thanks and have a happy holiday season! Everything is great so far!! Thank you so much for your kind driver and the easy delivery. You make this so easy and we love it. Thank you thank you!! [The poinsettias] were beautiful! We are wanting to increase our order next year. 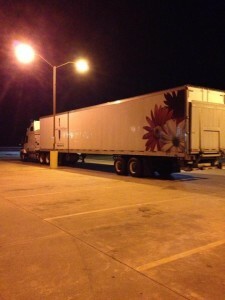 The delivery went smoothly and the flowers were very pretty this year. Thank you so much. The poinsettias are beautiful. Your driver was very nice and extremely helpful. We will definitely be in touch to do this again but much earlier! Again, thank you. I hope you and your family have a Merry Christmas. Tons of compliments at delivery time! We wanted to go ahead and reserve [our order] for next year. It went really well! It went very well. They are beautiful. My personal favorites are the white ones. So, I am thrilled with their size. They are so pretty. Thank you very much! The Poinsettias are beautiful! Thank you so much! Merry Christmas to you and your family. The plants arrived in great shape and we got nearly all the orders handed out this evening—just the normal few stragglers to go. Thanks again for all your help this year. We have you guys to thank for helping us have a successful fund raiser. Thanks again for everything! You guys are great. All plants were delivered with ease. I had a few extras to load up alone due to the delivery being about 40 mins late due to a highway accident because I had parents who had to go to work. But it all worked out. The driver did call and we were all on board. Thanks so much and we appreciate all your hard work. The plants are gorgeous as always. Hi, just wanted to say thank you! The plants I looked at were beautiful! I was a little scared because we have never done this before. I am very pleased. I got to the school early, just in case. The driver was 10 min. early (which was fine) and very friendly. This was a very good first experience!! Again, thank you! Have a Merry Christmas!!!!!! Just a note to say Thank You for all the help you’ve given me during our poinsettia fundraiser for the South Fulton Middle School Cheerleaders. Our poinsettia sales have helped us reach our goal of $20,000 to send the 18 cheerleaders and 1 alternate to the National Cheer Competition in Dallas, TX, in January. This was my first time dealing with a poinsettia fundraiser, but you made it very easy. From the first phone call, I felt that you really wanted this to be a good event for us. You’ve answered all of my questions quickly and completely, and you’ve been so great to work with. Whenever I called, you were willing to help me with whatever questions I had, even the dumb ones! You followed up on things I might not be sure about, too. It’s been a true pleasure working with you, and I will certainly not mind doing this again if I’m involved in next year’s fundraising. I wanted to send you and the staff of Parks Brothers Farm a huge “Thank You”. This was my first time being in charge of such a large Fundraiser for the girls varsity dance team. Whenever I called, you were willing to take the time to speak with me and help me with the process. You gave me great advice and you definitely had patience. When we received the Poinsettias they were beautiful and all the parents were excited to get them delivered. The driver was awesome. He was in great mood, friendly and helpful. The overall experience with Parks Brothers Farm has been wonderful and I would recommend anyone doing business with the company without any hesitation. Once again, Thank You. Look Forward to doing business again. The plants were absolutely fabulous! I wish I had ordered more to sell to all of the people who wish they had ordered. We will definitely be doing this again next year. Poinsettias are beautiful and another great fundraiser for us. I appreciate everything and have enjoyed working with you the past few years. We just took delivery of the plants at the church. Reports are that they are beautiful. Thank you very much for working with us. Until next year, enjoy the Christmas season! Thank you so much. The poinsettias are beautiful. Your driver was very nice and extremely helpful. We will definitely be in touch to do this again but much earlier! Again, thank you. I hope you and your family have a Merry Christmas. Everything went great! The plants so far look wonderful. Please put us down for the same amount for next year! I received my shipment of poinsettias this morning, and WOW!!! I am most impressed with the quality!! They are beautiful!!! The response to this fundraiser has been astounding and the the people of the community are very satisfied. Thanks to you and your very professional employees for making LAHS Student Council’s first Poinsettia Fund raiser a HUGE success. I am definitely looking forward to the Spring and next year already. I just want to tell you that the mums we received are AMAZING!!!! This was the first time we have sold mums as a fundraiser and they sold themselves!!! Their beauty and size spoke volumes to everyone. We will certainly be using you next year and passing your info to other groups. Thank you so much for wonderful customer service and beautiful plants. Wow!! Everyone has been overwhelmed by the beauty and size of their mums. They are gorgeous. We are very pleased with the mums and the service. We certainly will recommend your company in the future. Thank you for your help! Thanks so much. I always look forward to this fundraiser every year. You are so easy to work with and they really do sell theirselves! Thanks so much for the great service this year! 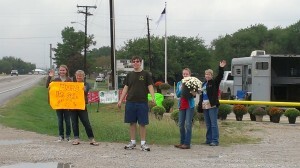 The plants were beautiful and we made almost $2000 for the band…. I just wanted to let you know how extremely pleased we were with our poinsettias! Everyone that has received them have commented on how beautiful they are. I also want to thank you for making this process so easy and your incredible attention to details. The Rains 4-H Club thanks you and we look forward to working with you next year! I have also shared your program with other County Extension Agents and 4-H Clubs, so hopefully they will be calling! Thanks for an absolutely wonderful fundraiser! We sold all of the poinsettias! We could have sold more! I am getting calls and texts today asking if we have any left. And a HUGE thank you for the maroon ones! I am enjoying “mine”. Gig ’em Aggies! We sold most of them but decided to bless nursing home residents with the few that we had left on Friday. We could have sold them… But decided to give as you have! All of the plants were beautiful. I will definitely want to make this a tradition. Thanks again for making it possible. The Poinsettias were fabulous. Very beautiful and full. Not the first broke one or anything. Everyone has had nothing but compliments to say. Thanks so much. We look forward to next year, and would also like information about any other fundraisers for the Spring. We are so excited about how great everything went. Not a single problem. Our fundraiser was great! After we got the flowers it was only a week and we were sold out. Thanks again for all your help. The mums were wonderful! Thank you for all your help! We are definitely planning on doing it again next year. Thank you Parks Brothers! With this great fundraiser we were able to buy dance costumes for our school team of 50+ 3rd-8th graders. Thank you!!! We love the poinsettias!! They looked beautiful and the customers have loved them! Thanks again for working with us! We received the poinsettias and they were beautiful! We sold every one the very next day. We will definitely be ordering again next year and will increase our orders for sure. I just wanted to let you know that all the orders were correct. The plants are beautiful and the Grissom parents are pleased. Look forward to doing business with you again next year. Thank you. Just got them out and sorted, they look awesome! Thank you very much for your service. The poinsettias are beautiful. 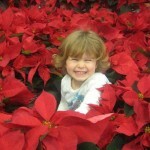 The cutest picture ever with your beautiful poinsettias! We want to participate again next Christmas with 1000 plants. We learned a lot and hopefully built a good client base to make the program even more successful next year. Yes, we would like to book 2011!! The plants are beautiful …everyone is happy!! Thank you so much for your assistance …I also appreciate your working so well with Laura in my absesnce on the delivery ….Merry Christmas !!! The easiest $4,000 dollars we have ever made! Thank you for accommodating our needs and guiding me through this process. The poinsettias are absolutely stunning! Better than we imagined. Thanks again. Yes, we would like to pre order poinsettias for 2011. We enjoyed this years fundraiser with you and plan on using you for many years. Thanks again for your help and cooperation! …the poinsettias are BEAUTIFUL!! Thanks! I just wanted to tell you how beautiful the plants are. Everyone loved them. Thank you so much. This was an easy fundraiser. You were such a joy to work with and made everything so easy for us. The plants are gorgeous! Even the kids thought they were impressive and think this is the easiest fundraiser they’ve done. We’re talking about doing to Mother’s Day Zinnias fundraiser in the spring! Just wanted to drop you a little note to tell you that the hanging baskets are absolutely BEAUTIFUL!!! I have had so many people want to know if I have anymore to sell. I have enjoyed doing business with you and look forward to using your company again next year. Thanks for all your help! I have done this fundraiser for several years at different schools and the flowers always come in when promised and look absolutely beautiful! Every year I have new people who are amazed how large and vibrant the flowers are for the price! Thank you so much and I plan on using you again next year! While we do our utmost to produce and ship the best quality of plants possible, we do not always satisfy every customer. If you are new and decide to order with us or are an existing customer, please let us know if there is a problem at the earliest possible time so that we have the opportunity to rectify the problem. We have just finished the most disappointing poinsettia sale ever! As I expressed to you on the phone, the 6 inch plants that you shipped us were the worst we have ever received. I just wanted to thank Parks Brothers for a wonderful fundraising experience. My group raised over $6000.00! You guys really went the extra mile to make sure all of our needs were met. I just wanted to say THANK YOU and to let you know we will be using your company again! I have already recommended your company to another group! The sales staff was VERY helpful throughout the process and worked with us on very short notice. Delivery was smooth and on time! It was a great fundraiser and the people who bought the poinsettias from us were impressed and thankful for the beautiful plants. The staff is very helpful. This was my first year as the Botany teacher and I had not realized all of the items that I needed to do by the end of October. Your staff was extremely helpful in helping me to get organized and develop an order for my class. Thank you so much. I was very impressed with the company staff and the plants were beautiful. It was an easy fund raiser with minimal planning. Thanks for your help in making our event a success. I want to thank you and your staff for being such a great help and so patient with me. This is the first fundraiser I have headed for our softball team and you all made it such an easy task and we cleared over $3600.00 in just a two week period of sales. We started late and it was rushed, but there is no way we could have made such a quick, easy profit with anything else. Our moms are very excited about doing this again next year. I won’t be involved because my youngest is graduating, YEA! But, I know they will do even better because we just didn’t have the time to reach everyone we could have. The poinsettias were BEAUTIFUL and everyone that we delivered to was very pleased and we are still getting compliments about them. Again, thank you so much and here’s wishing you all a VERY MERRY CHRISTMAS and A HAPPY NEW YEAR! We want to thank you again for your great customer service and the great product you provided us. We ending up making somewhere around a $1000!!! We now all can go on spring break thanks you guys! Go ahead and put us down for next year! I am last year’s President of the Langham Creek JROTC Booster Club. Last year was our first opportunity to work with Parks Brothers. We chose the Poinsettia fundraiser. We had looked at other alternatives and decided to work with Parks Brothers because of the very good wholesale price of the plants, the excellent BBB report and the helpful attitude of the employees I spoke with. From the beginning, communication was excellent. The delivery date became a small issue, as we needed our delivery on a date which might have inconvenienced the company. Our representative was very kind to make adjustments to their delivery schedule in order to deliver the poinsettias on the date we requested. The delivery arrived as promised and within the times quoted. It is a plus that they ship their own plants. It allows them to adjust their schedule as needed & since it is free, or rather, already included in the cost of the plants, we avoided the expense of shipping via FedEx or UPS. The plants are very beautiful. They are not tall, with lots of green leaves, as one might expect from a retail store. These plants have a striking, deep, rich color and appear as a mound of red, with the green leaves was an accent, rather than as the predominant color. The blooms are very large. Our customers loved the poinsettias. Packaging was excellent. You are provided with helpful information regarding the care of the plants. Our customers really appreciated the care sheets, which we delivered with each plant. The company does not provide paper copies of the sales sheet, or any other paperwork. These are available to download and print out as needed. We created our own sales sheet, as the one provided by Parks Brothers lists all the colors available. We chose to only offer red poinsettias. At first, I thought this an inconvenience, but once we designed our own sales sheets, we were able to print out just what we needed and customize the sheets to reflect our organization, as well as add additional information which was helpful to the cadets. I will be happy to send you copies of the sales sheet and other paperwork we created so you may get an idea of what you might do. Last, but not least, there was no pressure to sent payment right away. Through the whole process, the experience was very enjoyable. Our representative & the staff at Parks Brothers were always ready to answer questions & work with us. I would not hesitate to recommend this company to anyone, and am confident we will work with Parks Brothers again this year. The poinsettias were beautiful. Thanks so much to the wonderful staff, this was a great experience! Dwight was wonderful to walk me through and help me along the way. The plants that we receive from Parks Brothers Farm have always been of exceptional value. In the last 3 years we have been able to consistently increase our order size due to word of mouth. Our customers know, Parks Brothers poinsettias are the best! After years of fundraising, this is by far the easiest way of raising money I have ever been a part of. The poinsettia plants speak for themselves ~ quality, beauty, and top of the line in the care of the plants. The professionalism of the staff and customer service is second to none! The outcome of this successful business relationship has planted a seed of success for our program, and we are looking forward to watching that seed grow for many years to come, thanks to Parks Brothers Farm. Parks Brothers Farm saved the day for us this year. We over sold poinsettias during our winter fundraiser and needed a new grower to step up and help fill our orders. The folks at Parks Brothers met and then exceeded our expectations. All the poinsettias were big and beautiful. Delivery fit our schedule and above all, their price allowed us a greater profit margin. Our customers loved the Parks Brothers poinsettias and so do we! Poinsettia sale is becoming a Christmas tradition at Alpena. This sale makes our chapter some much needed funds. Wow! Thanks a million for the guidance in our first poinsettia sale. 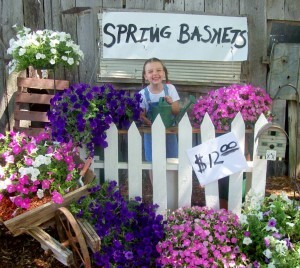 All of our customers raved about the beauty of the plants and we are thrilled at the profit we made for our 4-H Club. We definitely plan on doing the fundraiser again next year! Thanks for being so honest and helpful to us in the process! Thanks for the feedback, Charlotte. We are glad to have been able to help you and the Vian 4H and are doubly glad that you had a successful fundraiser. The poinsettias were beautiful,as always!I have been doing this fundraiser for years with different age groups and it the easiest fundraiser ever! The staff is so helpful and easy to work with. Thank you Tammy! We appreciate you using our fundraiser each year and are glad you had another successful one.